Bayer Advanced Garden Tree & Shrub Insect Control is a revolutionary new product that offers 12 months of systemic control of insects, and does not require spraying. The user simply mixes and pours it, like a drench, around the tree or shrub base. It contains imidacloprid (called Merit), which provides broad-spectrum systemic control, and is effective at very low use rates for killing insects. Ready to use concentrate - just mix with water! 33% More for the same cost! What insects does this product control? Recently added is the Emerald Ash Borer. What insects this product does not control? Some of the ornamental pests that it will not control include: mites, nematodes, gypsy moth, fall armyworm, eastern tent caterpillar. Soil Treatments No SPRAYING, just mix and pour, as a drench. Can be applied anytime of the year except when the ground is frozen, or water logged. Imparts systemic Protection throughout the plant. New Chemistry Provides an ingredient that insect pests are not tolerant to. Low Use Rates Less insecticide in the environment. Good Ecological Profile Low toxicity to mammals, birds, fish, and other non-target organisms. How do you apply product? For trees, mix 1oz of Bayer Advanced Tree & Shrub Insect Control per 1 inch of distance around the tree and place this amount in 1 gallon of water. 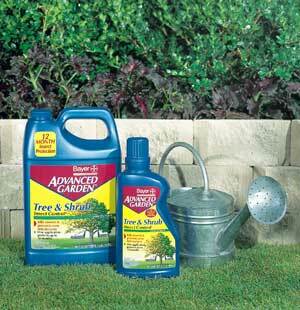 For shrubs, use 3 oz of the product per foot of height mixed in 1 gallon of water. If a tree measure 20 inches around then put 20 oz of the product in 1 gallon of water and pour around the base of the tree. If you have a 2-foot azalea, then place 6 oz of THIS PRODUCT in 1 gallon of water and pour around the base of the plant. 2.When is the best time of the year to apply the product? Late fall applications may be most appropriate for early spring pests such as birch leafminers, aphids, etc. For pests that occur later in the season, late fall or early spring applications are effective. Do NOT apply this product when the ground is frozen or waterlogged. If the ground is frozen or waterlogged, the material can not soak into the ground and get to the roots. Yes! The use rate is 1 ounce of the product per inch of distance around the tree trunk. Can I apply this to my fruit trees? No! The product in NOT registered or labeled for application to fruit trees. I have a 40' Hemlock tree. When do I apply to control the hemlock woolly adelgid? Soil treatments should be made when the soil is moist and not frozen or waterlogged. Fall to early winter (late August to early December) and spring to early summer (mid-March to mid-June) are optimal periods for making soil applications for the hemlock woolly adelgid. Can I use this on rose bushes? Yes, use 3 oz of this product per foot of height, put into 1 gallon of water, and pour around the base of the plant. Does weather conditions affect the products efficacy? Yes, it can. Uptake of this product is best when the plant is vigorously growing; thus, during periods when the soil is frozen or during drought conditions (or when transpiration is very low), uptake will most likely be reduced. Can a drought have impact? If a drought is occurring during a period in which an application is desired, it is recommended to water the plants to be treated well before making the soil application. Can too much rain impact the product efficacy? 22. Will this product have any impact on soil insects such as cutworms, earwigs, and termites when applied as directed? This product will suppress cutworm populations (provide approximately 60% control), it is not likely to have any effect on earwigs, Imidacloprid is an effective termiticide product and is sold under the trademark PremiseÒ on the professional side. As the product label is written, it is not registered for any of these pests.